The head of the World Bank has warned of a "human catastrophe" in the world's poorest countries unless more is done to tackle the global economic crisis. 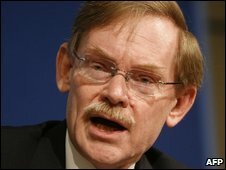 Speaking at the end of the World Bank's spring meeting, Robert Zoellick also called on rich nations to do more to help tackle global poverty. He said the crisis meant targets on tackling poverty in the poorest countries were unlikely to be met. The World Bank says an extra 53 million people are at risk of extreme poverty. "There is a widespread recognition that the world faces an unprecedented economic crisis, poor people could suffer the most and that we must continue to act in real time to prevent a human catastrophe," said Mr Zoellick. He added that no-one yet knew how long the global recession would last. In a joint statement, the World Bank and International Monetary Fund (IMF) said they had urged "all donors to accelerate delivery of commitments to increase aid, and for us all to consider going beyond existing commitments". World Bank managing director, and former Nigerian Finance Minister, Ngozi Okonjo-Iweala, said there was now a real crisis in Africa as a result of the worldwide recession. She said that as a result of falling demand for commodities and other exports, government budgets were falling short across the continent. "This means that [governments] cannot pay teachers or health workers, and we are hearing of people who can't eat three square meals a day," she said. Her comments came after the IMF said on Sunday that it would consider a request from Tanzania for additional financial support to help it cope with the impact of the global financial crisis. How much Tanzania has asked for has not been announced.